Sitting in those wooden, high-backed pews to mourn my Aunt’s passing, I had the revelation that the finality of a funeral is not the final goodbye many of us believe in. 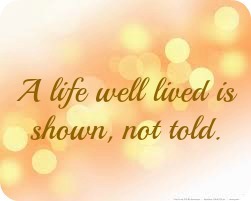 A funeral program speaks only about the generalities of a person’s life, a few snapshots on what’s important to share. The stories that are told by those that knew you make all the difference. When it came time for my aunt to be eulogized; her husband, children and family stood up and told stories about her life, expressing only what could be received if you were lucky enough to have spent any time with her. She was fun, youthful and made everyone feel special in ways that may seem small to others but are big in that person’s life. She belonged to her church choir so that she could praise the Lord with her gift. She belonged to a women’s organization to give back to her community. She poured love into every dish she cooked and shared generously by opening her home for family gatherings and get-togethers for friends. The memory of all that she was to so many people will live in our hearts forever. Many of us spend our waking hours pursuing what will look good on our resumes, social media and in perfectly posed photos. We chase after recognition and join organizations to feel a sense of belonging and wait to be praised by others for giving what can only come from the heart-humility and grace. Thank you so much for reading it and the encouraging support!